Thanks to Frank and The Drive Shaft Shop for sponsoring the 6 Speed Shootout again for ChallengerFest 2018! It would be nice to get Mass Traction to prep the track for the Challengerfest weekend. Thanks to Craig and Thitek for sponsoring the Index Class again for ChallengerFest 9! Special thanks to Mr. Hemi57 for sponsoring our Hard Luck Award this year. I hope no one wins it, but it's $200 from Mr. Dale if you do! Gray, my fav, I have a hard time screwing that up in the laundry!! Thanks to Solo Performance for sponsoring the best reaction time at ChallengerFest 2018 with one of their stainless cat back systems to the winner! All paid up and booked. See y'all there! 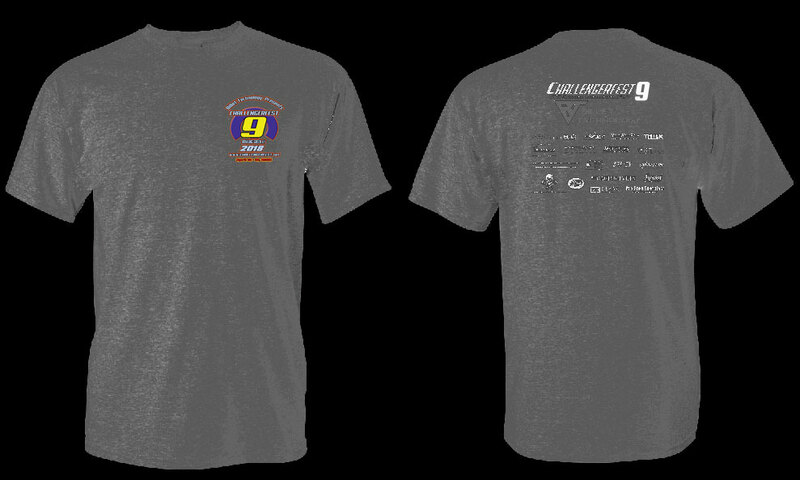 Thanks to Muscle Car Apparel for their support again for 2018! These guys will be ON SITE with their Mopar gear! Can someone tell if race fuel will be available at the track? If so what kind and method (pump or 5gal can)? Just out of curiosity, how many bidders are registered for the Demon auction. Show and Go Class for racers and car show. ???? They do have race fuel at the track. It is 110 leaded renegade. You might want to check with the track to be 100% sure. That is what they have sold in the past. Most everyone brings their own fuel. There is a local renegade distributor in BG. They have all of the renegade race fuels. You might want to check with them also to be sure they have what you want. Reminder, event T pre-order deadline is tomorrow 3/19/2018 at 12pm CST (NOON). Thanks to Andy and www.EastCoastMoparts.com for their support of ChallengerFest again for 2018! Killer prices on factory parts over there! Thanks to Martin CDJR for their support of ChallengerFest again for 2018! These guys are local to Bowling Green and will be on site at the event. Final prepay list updated and prepayment now closed. Won't be long now! Thanks to All Angles Design for their support of ChallengerFest 9! Is there any place where we have Racing4Vets items? Maybe I should start a thread on it. Thanks to Magnuson Superchargers for their support of ChallengerFest 9! They will be ON SITE. Will they be doing installations at a DEEPLY discounted rate?